The makers of Hillshire Farm(R) (www.hillshirefarm.com) products known for delivering quality, taste and craftsmanship in every bite, announced today the launch of the first-ever money-back guarantee program for the new Hillshire Farm NaturalsTM lunchmeat. 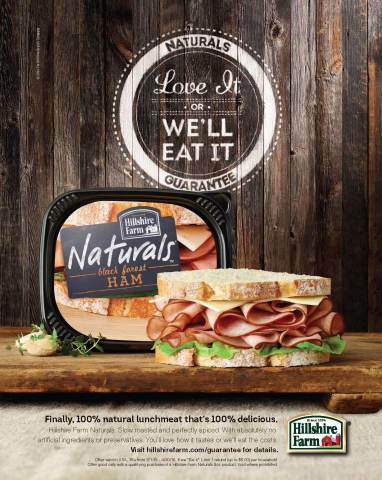 The new line of premium quality lunchmeat takes natural goodness to the next level and the Hillshire Farm brand guarantees families nationwide will agree. Hillshire is so confident it will take just one bite to prove the new Hillshire Farm Naturals lunchmeat is superior in taste, it is putting the premium lunchmeat to the test. Beginning today through April 30, 2015, consumers who purchase a package of Hillshire Farm Naturals lunchmeat, which contains no artificial ingredients, preservatives, colors or added nitrites/nitrates, can visit www.hillshirefarm.com/guarantee and select “Love It” or “We’ll Eat It.” For those who declare they “Love It,” Hillshire will help provide up to 500,000 meals to individuals in need by making a donation to Feeding America(R), the largest domestic hunger-relief organization with 200 member food banks across the country. To support Feeding America’s efforts, Hillshire will donate $50,000, with $1 equaling ten meals. Consumers who select “We’ll Eat It” will receive a refund of up to $6, or they can choose to have Hillshire donate their refund to Feeding America. Hillshire Farm brand has been providing quality meat products since 1934. Our products are versatile, easy to use and are available in convenient stay-fresh packaging in a variety of cuts, sizes and flavors. The Hillshire Farm portfolio of quality meats includes Hillshire Farm lunchmeats, Hillshire Farm Smoked Sausage, Hillshire Farm Link Sausage and Hillshire Farm(R) Lit’l Smokies(R) cocktail links. Visit www.hillshirefarm.com for additional information. Tyson Foods, Inc. (NYSE:TSN) , with headquarters in Springdale, Arkansas, is one of the world’s largest producers of chicken, beef, pork and prepared foods that include leading brands such as Tyson(R), Jimmy Dean(R), Hillshire Farm(R), Sara Lee(R) frozen bakery, Ball Park(R), Wright(R), Aidells(R) and State Fair(R). The company was founded in 1935 by John W. Tyson, whose family has continued to lead the business with his son, Don Tyson, guiding the company for many years and grandson, John H. Tyson, serving as the current chairman of the board of directors. Tyson Foods provides a wide variety of protein-based and prepared foods products and is the recognized market leader in the retail and foodservice markets it serves, supplying customers throughout the United States and approximately 130 countries. It has approximately 124,000 Team Members employed at more than 400 facilities and offices in the United States and around the world. Through its Core Values, Code of Conduct and Team Member Bill of Rights, Tyson Foods strives to operate with integrity and trust and is committed to creating value for its shareholders, customers and Team Members. The company also strives to be faith-friendly, provide a safe work environment and serve as stewards of the animals, land and environment entrusted to it.